With Julia Llewellyn’s new book just out I thought I would read another of her offerings that I haven’t read alongside it. 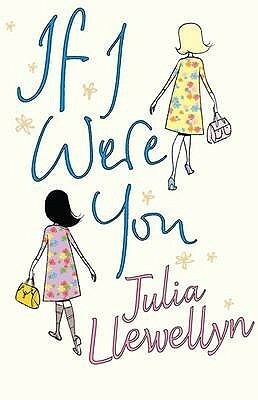 If I were you centres around two friends Sophie and Natasha who met at school and whose lives have gone in different directions but have remained firm friends, never living too far apart from one another. This formula was sure to be a hit with me! The book started off a little hard to get into. We are introduced to Sophie and Natasha quickly and Sophie’s former Stepbrother Marcus who also plays a big part in the story, but if anything, things move too quickly to begin with, especially when compared to the rest of the novel, and so it almost begins by leaving the reader wanting more. One Marcus’s wedding is out of the way, however, the meaty part of the novel begins and I felt I could settle into the storyline and get to know the characters a lot better. I really enjoyed the way the characters insecurities are shown and found these really identifiable in both of the girls. The author doesn’t just deal with the problem of dating and relationships but also what happens when you find the one and the marriage perhaps doesn’t turn out the way you had planned. She also covers career problems and money problems all of which are relevant to readers in today’s society. I think that storyline was really well thought out and some of the twist and turns you genuinely don’t see coming. I found some of the situation the girls find themselves in particularly cringe worthy, but only because I have found myself in some of these situations myself! The struggles that the girls went through also rang true with me and like in all good books, I found myself struggling along with the heroines, hoping everything would work out for them in the end. Like her novel ‘Love Nest’ Julia Llewellyn has covered all bases with this book, humour, love and everyday life struggles and so I think that there is something here for every reader. One the initial first couple of chapters are out of the way, this is a book that you can get your teeth into and will find realty difficult to put down. A great mid-week read!